Five years ago, the biggest U.S. banks were so terrifyingly big that they had to be bailed out by the U.S. government in order to survive a financial crisis, lest they obliterate the global financial system. Today they are even bigger. The four biggest U.S. banks -- JPMorgan Chase, Bank of America, Citigroup and Wells Fargo -- today have about $7.8 trillion in assets, or about 47 percent of U.S. gross domestic product, up from $6.4 trillion, or 43 percent of GDP, at the time of the crisis in 2008. The six biggest banks, a group that now includes Goldman Sachs and Morgan Stanley, now have $9.6 trillion in assets, or nearly 58 percent of GDP. Of the Big Four, only Citigroup has spent the years since the crisis trimming assets -- which, in the world of bank accounting, are generally considered risks. The others have bulked up, partly because they absorbed other banks during the crisis. Bank regulators have spent the interim trying to find ways to avoid having to bail out banks in the next crisis. Some even claim the mission has been accomplished. In their view, the Dodd-Frank financial-reform act created a way for regulators, known as "resolution authority," to safely wind down a big bank that gets into trouble. But some critics say resolution authority is just a bailout by another name. And others, including even some bankers, worry that resolution authority still hasn't solved the problem of banks being too big to fail. But however you feel about the big banks, there's no denying they're bigger than ever. Update: Hamilton Place Strategies partner Tony Fratto, a former Treasury official and deputy press secretary under President George W. Bush, and an avowed lover of big banks, denies the big banks are bigger than ever, actually. He argues that smaller banks are growing more quickly than big banks. 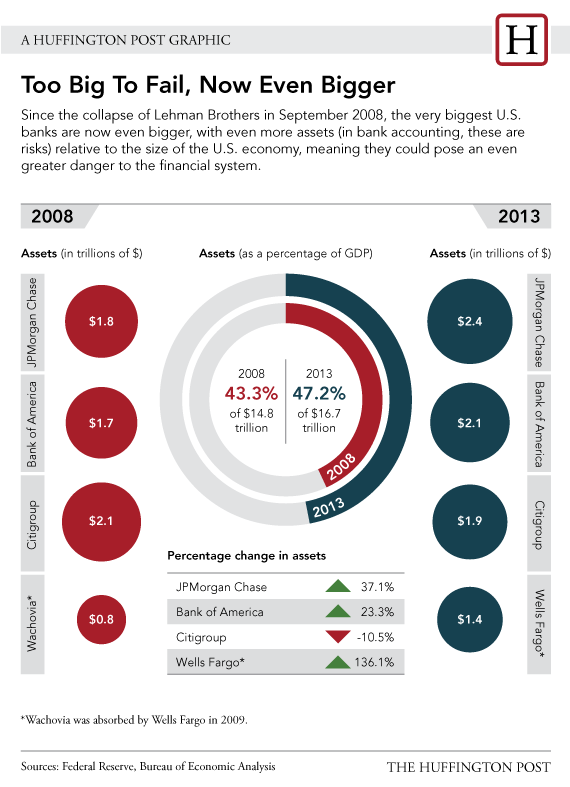 He also says that, as a percentage of GDP, the Big Four's assets are down from 2012. And indeed they are, by that measure, but just a tiny bit. And total assets for the biggest banks are at an all-time high. So these banks are still getting bigger, but at a slower pace. Adjust your comfort levels accordingly.